24k Baht Gold Clasp - Thai Baht Gold Clasps. Thailand Gold Jewelry is a western managed company of Thai Baht Gold S-Claps and W-Clasps for any size bracelet or chain you need. The W-Clasps are typically used for connecting the Thai Baht Gold Necklaces or Chain in the front chest area of your body and can be used to also add a pendant or amulet to the chain. 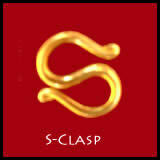 The S-Clasps are typically used to connect Thai Baht Gold Bracelets and Gold Chains that fasten behind the neck area. 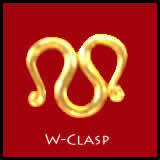 W-Clasps and S-Clasps are 99% pure gold by weight to make them soft enough to open and close without breaking. There is no exact or fixed weight when making clasps, since they are used to increase the weight of the chain or bracelet to the match the Baht weight ordered. For replacement clasp we sell we try to target the weight as closely as possible to 1.1 grams per Baht weight of the chain or bracelet. So if your gold chain is 5 Baht gold weight the clasp would weigh approximately 5.5 grams, but it may be heavier or lighter depending on what we have in stock at the time of shipment. We do not guarantee the weight on replacement clasps. When ordering your gold replacement clasp please check the baht of your bracelet or chain carefully and then select the correct chain or bracelet weight on the order form above. Thailand Gold Jewelry ships replacement clasps by Registered Air Mail and we offer a special flat rate of 20.00 per item to North America and most other countries. We normally ship the clasps within 3 working days of order receipt, but please allow 10 working days for Registered Air Mail delivery to your location. For any special needs or additional information, please contact us by Email or Telephone during normal business hours.